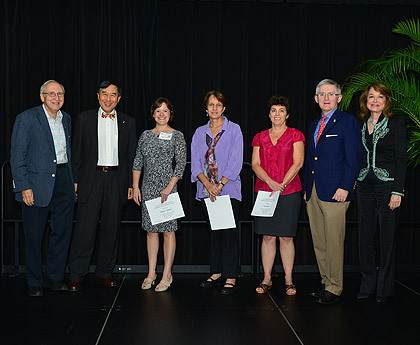 The University of Maryland's Division of Research announced the winners of the inaugural “Research Communicator Impact Award” at the annual Research Leaders Luncheon on October 7, 2015. This inaugural award for 2015 highlights outstanding op-ed style articles by University of Maryland researchers appearing in prominent print outlets or web-based news outlets. This new award recognizes individuals who have taken a proactive approach to disseminating their research and scholarly findings or opinions on research issues and policies. Entries were evaluated by a committee based on each piece’s quality, impact, and visibility. • Nancy Gallagher of the School of Public Policy for her piece in Foreign Policy, titled “Will It Play in Persepolis?,” which examined the U.S.-Iran nuclear deal and had a noted effect on official action, offering members of Congress deeper insights into public attitudes than they otherwise would have had. • Jennifer Golbeck of the iSchool for her piece in Slate, titled “Smart People Prefer Curly Fries,” which explored how algorithms can analyze people's social media profiles and find out things about them that they never intended to share. • Karen Lips of the Department of Biology within the College of Computer, Mathematical, and Natural Sciences, for her piece in the New York Times, titled “Stopping the Next Amphibian Apocalypse,” which helped focus the attention of decision makers and regulators on a gap in policy that allows the introduction of wildlife into the U.S. without testing diseases and parasites, nor requires any quarantine or containment if diseases were found. • Rebecca Ratner of the Robert H. Smith School of Business for her piece in the Los Angeles Times, titled “Why You're Better Off Going Alone Than Not at All,” through which she reached more than one million news consumers with her research on solo consumerism, published in the "Journal of Consumer Research." Besides her op-ed in the Los Angeles Times, Rebecca generated more than 100 media placements focused on her work during the three-month period from April to June 2015.